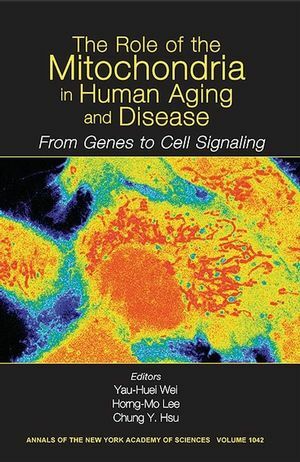 Virtually every aspect of mitochondrial research and medicine is addressed in this volume, including mitochondrial function and dysfunction, free radical biology relevant to mitochondrial dysfunction, the role of mitochondria in apoptosis, and abnormal signaling processes and disease mechanisms associated with aging, mtDNA mutations, or mitochondrial damage. NOTE: Annals volumes are available for sale as individual books or as a journal. For information on institutional journal subscriptions, please visit www.blackwellpublishing.com/nyas. Yau-Huei Wei is the editor of The Role of Mitochondria in Human Aging and Disease: From Genes to Cell Signaling, Volume 1042, published by Wiley. Horng-Mo Lee is the editor of The Role of Mitochondria in Human Aging and Disease: From Genes to Cell Signaling, Volume 1042, published by Wiley. Preface: Yau-Huei Wei, Horng-Mo Lee, and Chung Y. Hsu. Part I: Mitochondrial Disease Models:. 1. Mitochondria-Based Model for Fetal Origin of Adult Disease and Insulin Resistance: Hong Kyu Lee, Kyong Soo Park, Young Min Cho, Yun Yong Lee, and Youngmi Kim Pak. 2. Evolutional Analysis in Determining Pathogenic versus Nonpathogenic Mutations of ATPase 6 in Human Mitochondriopathy: Chin-Yuan Tzen and Tsu-Yen Wu. 3. Restoration of Mitochondrial Function in Cells with Complex I Deficiency: Yidong Bai, Jeong Soon Park, Jian-Hong Deng, Youfen Li, and Peiqing Hu. 4. Hearing Loss in Mitochondrial Disorders: Chang-Hung Hsu, Haeyoung Kwon, Cherng-Lih Perng, Ren-Kui Bai, Pu Dai, and Lee-Jun C. Wong. 5. Brain Single Photon Emission Computed Tomography in Patients with A3243G Mutation in Mitochondrial DNA tRNA: Peterus Thajeb, Ming-Che Wu, Bing-Fu Shih, Chin-Yuan Tzen, Ming-Fu Chiang, and Rey-Yue Yuan. 6. Upregulation of Matrix Metalloproteinase 1 and Disruption of Mitochondrial Network in Skin Fibroblasts of Patients with MERRF Syndrome: Yi-Shing Ma, Yin-Chiu Chen, Ching-You Lu, Chun-Yi Liu, and Yau-Huei Wei. 7. Increased Oxidative Damage with Altered Antioxidative Status in Type 2 Diabetic Patients Harboring the 16189 T to C Variant of Mitochondrial DNA: Tsu-Kung Lin, Shang-Der Chen, Pei-Wen Wang, Yau-Huei Wei, Cheng-Feng Lee, Tzu-Ling Chen, Yao-Chung Chuang, Teng-Yeow Tan, Ku-Chou Chang, and Chia-Wei Liou. 8. Alteration of the Copy Number of Mitochondrial DNA in Leukocytes of Patients with Hyperlipidemia: Chin-San Liu, Ching-Ling Kuo, Wen-Ling Cheng, Ching-Shan Huang, Cheng-Feng Lee, and Yau-Huei Wei. 9. A New Noninvasive Test to Detect Mitochondrial Dysfunction of Skeletal Muscles in Progressive Supranuclear Palsy: Yung-Yee Chang, Chiang-Hsuan Lee, Min-Yu Lan, Hsiu-Shan Wu, Chiung-Chih Chang, and Jia-Shou Liu. 10. High Prevalence of the COII/tRNALys Intergenic 9-bp Deletion in Mitochondrial DNA of Taiwanese Patients with MELAS or MERRF Syndrome: Chin-San Liu, Wen-Ling Cheng, Yi-Yun Chen, Yi-Shing Ma, Cheng-Yoong Pang, and Yau-Huei Wei. 11. Analysis of Proteome Bound to D-Loop Region of Mitochondrial DNA by DNA-Linked Affinity Chromatography and Reverse-Phase Liquid Chromatography/Tandem Mass Spectrometry: Yon-Sik Choi, Bo-Kyung Ryu, Hye-Ki Min, Sang-Won Lee, and Youngmi Kim Pak. 12. Mitochondrial Transcription Factor A in the Maintenance of Mitochondrial DNA: Overview of Its Multiple Roles: Dongchon Kang and Naotaka Hamasaki. 13. Mitochondrial Genome Instability and mtDNA Depletion in Human Cancers. By Hsin-Chen Lee, Pen-Hui Yin, Jin-Ching Lin, Cheng-Chung Wu, Chih-Yi Chen, Chew-Wun Wu, Chin-Wen Chi, Tseng-Nip Tam, and Yau-Huei Wei. 14. Frequent Occurrence of Mitochondrial Microsatellite Instability in the D-Loop Region of Human Cancers: Yue Wang, Vincent W.S. Liu, Hextan Y.S. Ngan, and Phillip Nagley. 15. Analysis of Heteroplasmy in Hypervariable Region II of Mitochondrial DNA in Maternally Related Individuals: Mei-Chen Lo, Horng-Mo Lee, Ming-Wei Lin, and Chin-Yuan Tzen. 16. Deleted Mitochondrial DNA in Human Luteinized Granulosa Cells: Heng-Kien Au, Shyh-Hsiang Lin, Shih-Yi Huang, Tien-Shun Yeh, Chii-Ruey Tzeng, and Rong-Hong Hsieh. 17. Identification of Human-Specific Adaptation Sites of ATP6: Bey-Liing Mau, Horng-Mo Lee, and Chin-Yuan Tzen. 18. Repeated Ovarian Stimulations Induce Oxidative Damage and Mitochondrial DNA Mutations in Mouse Ovaries: Hsiang-Tai Chao, Shu-Yu Lee, Horng-Mo Lee, Tien-Ling Liao, Yau-Huei Wei, and Shu-Huei Kao. 19. Calcium Stimulates Mitochondrial Biogenesis in Human Granulosa Cells: Tien-Shun Yeh, Jau-Der Ho, Vivian Wei-Chung Yang, Chii-Ruey Tzeng, and Rong-Hong Hsieh. 20. Dynamics of Mitochondria and Mitochondrial Ca2+ near the Plasma Membrane of PC12 Cells: A Study by Multimode Microscopy: De-Ming Yang, Chung-Chih Lin, Hsia Yu Lin, Chien-Chang Huang, Din Ping Tsai, Chin-Wen Chi, and Lung-Sen Kao. 21. Propofol Specifically Inhibits Mitochondrial Membrane Potential but Not Complex I NADH Dehydrogenase Activity, Thus Reducing Cellular ATP Biosynthesis and Migration of Macrophages: Gong-Jhe Wu, Yu-Ting Tai, Ta-Liang Chen, Li-Ling Lin, Yune-Fang Ueng, and Ruei-Ming Chen. 22. Abnormal Mitochondrial Structure in Human Unfertilized Oocytes and Arrested Embryos: Heng-Kien Au, Tien-Shun Yeh, Shu-Huei Kao, Chii-Ruey Tzeng, and Rong-Hong Hsieh. 23. Oxidative Damage and Mitochondrial DNA Mutations with Endometriosis: Shu-Huei Kao, Hsieng-Chiang Huang, Rong-Hong Hsieh, Su-Chee Chen, Ming-Chuan Tsai, and Chii-Reuy Tzeng. 24. Neuroprotective Role of Coenzyme Q10 against Dysfunction of Mitochondrial Respiratory Chain at Rostral Ventrolateral Medulla during Fatal Mevinphos Intoxication in the Rat: F C.H. LI, H P TSENG, and A Y.W. Chang. 25. Mitochondrial Dysfunction and Oxidative Stress as Determinants of Cell Death/Survival in Stroke: Pak H. Chan. 26. Oxidative Damage in Mitochondrial DNA Is Not Extensive: Kok Seong Lim, Kandiah Jeyaseelan, Matthew Whiteman, andrew Jenner, and Barry Halliwell. 27. Enhanced Generation of Mitochondrial Reactive Oxygen Species in Cybrids Containing 4977-bp Mitochondrial DNA Deletion: Mei-Jie Jou, Tsung-I Peng, Hong-Yueh Wu, and Yau-Huei Wei. 28. S-Nitrosoglutathione and Hypoxia-Inducible Factor-1 Confer Chemoresistance against Carbamoylating Cytotoxicity of BCNU in Rat C6 Glioma Cells: Ding-I Yang, Shang-Der Chen, Jiu-Haw Yin, and Chung Y. Hsu. 29. Celecoxib Induces Heme-Oxygenase Expression in Glomerular Mesangial Cells: Chun-Cheng Hou, Su-Li Hung, Shu-Huei Kao, Tso Hsiao Chen, and Horng-Mo Lee. 30. Oxidative Stress-Induced Depolymerization of Microtubules and Alteration of Mitochondrial Mass in Human Cells: Cheng-Feng Lee, Chun-Yi Liu, Rong-Hong Hsieh, and Yau-Huei Wei. 31. Blood Lipid Peroxides and Muscle Damage Increased following Intensive Resistance Training of Female Weightlifters: Jen-Fang Liu, Wei-Yin Chang, Kuei-Hui Chan, Wen-Yee Tsai, Chen-Li Lin, and Mei-Chieh Hsu. 32. Anti-Inflammatory and Antioxidative Effects of Propofol on Lipopolysaccharide-Activated Macrophages: Ruei-Ming Chen, Tyng-Guey Chen, Ta-Liang Chen, Li-Ling Lin, Chia-Chen Chang, Hwa-Chia Chang, and Chih-Hsiung Wu. 33. Protective Effect of -Keto-ß-Methyl-n-Valeric Acid on BV-2 Microglia under Hypoxia or Oxidative Stress: Hsueh-Meei Huang, Hsio-Chung Ou, Huan-Lian Chen, Rolis Chien-Wei Hou, and Kee Ching G. Jeng. 34. Oxidative Toxicity in BV-2 Microglia Cells: Sesamolin Neuroprotection of H2O2 Injury Involving Activation of p38 Mitogen-Activated Protein Kinase: Rolis Chien-Wei Hou, Chia-Chuan Wu, Jing-Rong Huang, Yuh-Shuen Chen, and Kee-Ching G. Jeng. 35. Angiotensin II Stimulates Hypoxia-Inducible Factor 1 Accumulation in Glomerular Mesangial Cells: Tso-Hsiao Chen, Jin-Fong Wang, Paul Chan, and Horng-Mo Lee. 36. Effects of Glucose and -Tocopherol on Low-Density Lipoprotein Oxidation and Glycation: Chun-Jen Chang, Rong-Hong Hsieh, Hui-Fang Wang, Mei-Yun Chin, and Shih-Yi Huang. 37. Identification of Three Mutations in the Cu,Zn-Superoxide Dismutase (Cu,Zn-SOD) Gene with Familial Amyotrophic Lateral Sclerosis: Transduction of Human Cu,Zn-SOD into PC12 Cells by HIV-1 TAT Protein Basic Domain: Chih-Ming Chou, Chang-Jen Huang, Chwen-Ming Shih, Yi-Ping Chen, Tsang-Pai Liu, and Chien-Tsu Chen. 38. Kainic Acid-Induced Oxidative Injury Is Attenuated by Hypoxic Preconditioning: Cheng-Hao Wang, Anyu Chang, May-Jywan Tsai, Henrich Cheng, Li-Ping Liao, and Anya Maan-Yuh Lin. 39. Antioxidant N-Acetylcysteine Blocks Nerve Growth Factor-Induced H2O2/ERK Signaling in PC12 Cells: Liang-Yo Yang, Wun-Chang Ko, Chun-Mao Lin, Jia-Wei Lin, Jen-Chine Wu, Chien-Ju Lin, Huey-Hwa Cheng, and Chwen-Ming Shih. 40. Effect of Enhanced Prostacyclin Synthesis by Adenovirus-Mediated Transfer on Lipopolysaccharide Stimulation in Neuron-Glia Cultures: May-Jywan Tsai, Song-Kun Shyue, Ching-Feng Weng, Ying Chung, Dann-Ying Liou, Chi-Ting Huang, Huai-Sheng Kuo, Meng-Jen Lee, Pei-Teh Chang, Ming-Chao Huang, Wen-Cheng Huang, K D Liou, and Henrich Cheng. 41. Potential Mechanism of Blood Vessel Protection by Resveratrol, a Component of Red Wine: Huei-Mei Huang, Yu-Chih Liang, Tzu-Hurng Cheng, Cheng-Heien Chen, and Shu-Hui Juan. 42. Pravastatin Attenuates Ceramide-Induced Cytotoxicity in Mouse Cerebral Endothelial Cells with HIF-1 Activation and VEGF Upregulation: Shang-Der Chen, Chaur-Jong Hu, Ding-I Yang, Abdullah Nassief, Hong Chen, Kejie Yin, Jan Xu, and Chung Y. Hsu. 43. Alleviation of Oxidative Damage in Multiple Tissues in Rats with Streptozotocin-Induced Diabetes by Rice Bran Oil Supplementation: Rong-Hong Hsieh, Li-Ming Lien, Shyh-Hsiang Lin, Chia-Wen Chen, Huei-Ju Cheng, and Hsing-Hsien Cheng. 44. Curcumin Inhibits ROS Formation and Apoptosis in Methylglyoxal-Treated Human Hepatoma G2 Cells: Wen-Hsiung Chan, Hsin-Jung Wu, and Yan-Der Hsuuw. 45. Prevention of Cellular Oxidative Damage by an Aqueous Extract of Anoectochilus formosanus: Leng-Fang Wang, Chun-Mao Lin, Chwen-Ming Shih, Hui-Ju Chen, Borcherng Su, Cheng-Chuang Tseng, Bao-Bih Gau, and Kur-Ta Cheng. 46. Inhibitory Effects of a Rice Hull Constituent on Tumor Necrosis Factor , Prostaglandin E2, and Cyclooxygenase-2 Production in Lipopolysaccharide-Activated Mouse Macrophages: Sheng-Tung Huang, Chien-Tsu Chen, Kur-Ta Chieng, Shih-Hao Huang, Been-Huang Chiang, Leng-Fang Wang, Hsien-Saw Kuo, and Chun-Mao Lin. 47. Raffinee in the Treatment of Spinal Cord Injury: An Open-Labeled Clinical Trial: Hsin-Ying Chen, Jer-Min Lin, Hung-Yi Chuang, and Wen-Ta Chiu. 48. Induction of Thioredoxin and Mitochondrial Survival Proteins Mediates Preconditioning-Induced Cardioprotection and Neuroprotection: Chuang C. Chiueh, Tsugunobu andoh, and P Boon Chock. 49. Mitochondrion-Targeted Photosensitizer Enhances the Photodynamic Effect-Induced Mitochondrial Dysfunction and Apoptosis: Tsung-I Peng, Cheng-Jen Chang, Mei-Jin Guo, Yu-Huai Wang, Jau-Song Yu, Hong-Yueh Wu, and Mei-Jie Jou. 50. Attenuation of UV-Induced Apoptosis by Coenzyme Q10 in Human Cells Harboring Large-Scale Deletion of Mitochondrial DNA: Cheng-Feng Lee, Chun-Yi Liu, Shu-Mei Chen, Marianna Sikorska, Chen-Yu Lin, Tzu-Ling Chen, and Yau-Huei Wei. 51. Antisense RNA to Inducible Nitric Oxide Synthase Reduces Cytokine-Mediated Brain Endothelial Cell Death: Ding-I Yang, Shawei Chen, Uthayashanker R. Ezekiel, Jan Xu, Yingji Wu, and Chung Y. Hsu. 52. 2,6-Diisopropylphenol Protects Osteoblasts from Oxidative Stress-Induced Apoptosis through Suppression of Caspase-3 Activation: Ruei-Ming Chen, Gong-Jhe Wu, Hwa-Chia Chang, Jue-Tai Chen, Tzeng-Fu Chen, Yi-Ling Lin, and Ta-Liang Chen. 53. Nitric Oxide Induces Osteoblast Apoptosis through a Mitochondria-Dependent Pathway: Wei-Pin Ho, Ta-Liang Chen, Wen-Ta Chiu, Yu-Ting Tai, and Ruei-Ming Chen. 54. Bcl-2 Gene Family Expression in the Brain of Rat Offspring after Gestational and Lactational Dioxin Exposure: Shwu-Fen Chang, Yu-Yo Sun, Liang-Yo Yang, Ssu-Yao Hu, Shih-Ying Tsai, Wen-Sen Lee, and Yi-Hsuan Lee. 55. IL-5 Inhibits Apoptosis by Upregulation of c-myc Expression in Human Hematopoietic Cells: Shu-Hui Juan, Jeffrey Jong-Young Yen, Horng-Mo Lee, and Huei-Mei Huang. 56. Detection of Apoptosis and Necrosis in Normal Human Lung Cells Using 1H NMR Spectroscopy: Chwen-Ming Shih, Wun-Chang Ko, Liang-Yo Yang, Chien-Ju Lin, Jui-Sheng Wu, Tsui-Yun Lo, Shwu-Huey Wang, and Chien-Tsu Chen. 57. Cadmium Toxicity toward Caspase-Independent Apoptosis through the Mitochondria-Calcium Pathway in mtDNA-Depleted Cells: Yung-Luen Shih, Chien-Ju Lin, Sheng-Wei Hsu, Sheng-Hao Wang, Wei-Li Chen, Mei-Tsu Lee, Yau-Huei Wei, and Chwen-Ming Shih. 58. Pectinesterase Inhibitor from Jelly Fig (Ficus awkeotsang Makino) Achene Induces Apoptosis of Human Leukemic U937 Cells: Jia-Huei Chang, Yuh-Tai Wang, and Hung-Min Chang. 59. Enhancement of Cisplatin-Induced Apoptosis and Caspase 3 Activation by Depletion of Mitochondrial DNA in a Human Osteosarcoma Cell Line: Hsiu-Chuan Yen, Yi-Chia Tang, Fan-Yi Chen, Shih-Wei Chen, and Hideyuki J. Majima. 60. Thallium Acetate Induces C6 Glioma Cell Apoptosis: Chee-Fah Chia, Soul-Chin Chen, Chin-Shyang Chen, Chuen-Ming Shih, Horng-Mo Lee, and Chih-Hsiung Wu.